Imagine ... A city square by night, the paving is scattered with hundreds or thousands of tiny lights. Each light is set into the paving and sparkles and shimmers. Walking across the square is like walking over a magical glowing sea of sparkly lights. These are Tsola Lights. As well as looking beautiful, they have a huge technological advantage: they are powered only by daylight. During the day they use their internal solar cells to make their own electricity. There are no running costs, they must be the most environmentally friendly lights around. The Tsola Lights turn themselves on automatically at dusk and run from the electricity they have stored up during the day. At dawn they turn their lights off and start charging up again for the next night. Installation could not be easier. Because there is no wiring and no dangerous mains voltage, they can be set almost anywhere. Ideal for large outdoor areas like Leisure Parks, or for marking country walks, car parks, steps, drives. I ran, literally, across something similar in Springfield Illinois. In this case it was a lighted left hand turn lane. I wish I'd taken a picture. When the left hand turn light came on at the intersection, lights in the pavement, illuminated the way for the left hand turn. Very cool. As Tom Peters would say, Design WOW! Where can I find these? Are they affordable enough for home application? They would look great in the patio I am currently laying. Please note that Paver Light is a registered trademark owned by Kerr Lighting. Please change your web page and search accordingly. I found this webside and to tell you that, this will be the future in all homes and sidewalks. The Solar crystal brick lights are the best of the best I seen so go and see it for yourself. I am looking for solar powered brick patio pavers. Can you help? HI . Where can i buy these lights in Australia? The professional grade paver light offers a beautiful accent to any interlocking concrete pavement, in addition to adding safety and security. Our products are UL listed, and completely water proof. They are un-affected by deicing salts, ocean environments, and will not grow weeds inside the lens. Once installed, they are maintenance free and will provide a 15,000 hour service life. lamp modules are easily replaced in about a minute. I love the pavestone solar pavers. They are the same size as the other pavestone pavers so you just pop one out and put in a solar pavestone. I have had numerous compliments about how pretty they are and the added light. They are also a good security feature. 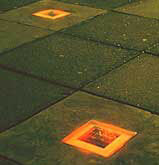 We are Manufactures of Paver Lights Solar powered suitable for domestic and commercial applications.We are A BRITISH COMPANY AND PROUD OF IT. Hi everyone, companies are doing some great things with solar LED architectural lighting. Would love to hear your thoughts on our line at www.solarcynergy.com! If you're interested in solar pavers, we have a variety of shapes and sizes. You can see our products and pricing at www.solarlightworks.com . I am a paver installer but have never installed solar paver lights. However, I can see the advantage over low voltage lights because they don't need wire connections or a transformer. But what kind of light do they give off? Solar Powered Lights in pavers will make a nice looking park in the city. Solar power is the only way out, solve our energy resource's problem. Interesting article. Not everybody know that solar energy is easy to use and cheap.